QuickBooks Pro Advisors can learn about revenue-sharing opportunities and product enhancements at booth 38A. The Neat Company, a recognized leader in expense tracking and bookkeeping automation solutions for small businesses, today announced that it will preview new platform features and functionalities to bookkeepers and accountants at QuickBooks Connect in San Jose, California. QuickBooks Pro Advisors will also have the opportunity to learn about the company’s Neat-Freak Partner Program, which offers a fun, unique, and profitable opportunity for Neat-using accountants and bookkeepers. Attendees of QuickBooks Connect 2018, especially QuickBooks Pro advisors, are encouraged to visit The Neat Company at booth 38A to meet with Neat leadership to learn more about the Neat-Freak Partner programs benefits, including both aggressive revenue sharing and unique opportunities for our partners to gain access to Neat’s customer base of over 100,000 small business. 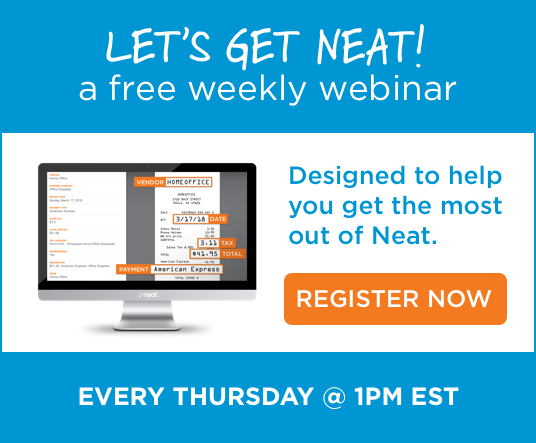 The Neat Company designed its Neat-Freak partner program, which launched in June, to enable stronger collaboration among accountants and bookkeepers and their clients so that they can improve efficiency and grow their businesses. Accountants and bookkeepers can choose from two distinct partner plans, and all Neat-Freak partners can access ongoing, dedicated support from the team stationed at Neat headquarters in Philadelphia. QuickBooks Pro Advisors who visit The Neat Company’s booth will also have an opportunity to learn more about new features and functionalities that will be launched next year. Both the Neat Company leadership team and The Neat Company’s customer advisory panel of 25 QuickBooks Pro advisors will be on-hand to discuss the product’s new user interface and features such as bank account fetching and real-time mileage tracking. The most significant release that the Neat Company will announce is support for QuickBooks Desktop 2019. “We’re excited to offer support for QuickBooks Desktop 2019, which is a unique integration in the marketplace that offers accountants and bookkeepers a way to integrate Neat with their preferred QuickBooks deployment,” said Jeff Price, Vice President of Product Development, The Neat Company. The Neat Company provides small businesses and sole proprietors with cloud-based expense and document management system, which streamlines the collection and retention of important financial documents, automatically extracts key information, and provides real-time insights to automate time-consuming bookkeeping tasks. Neat’s patented ID2 technology intuitively classifies documents and populates key data fields, helping small businesses organize and categorize financial information that is critical to their business’s needs. In order to manage the high, daily volume of expense transactions and financial documents, Neat gives small business owners the power to capture and access files from any device, taking productivity to the next level. By consolidating reporting and eliminating time-consuming tasks like data entry, Neat streamlines accounting and tax-related workflows, giving time back to small businesses so they can get to what matters most.